The Sports Kolache: Was 1560 The Game Represented at the Clemens Presser? 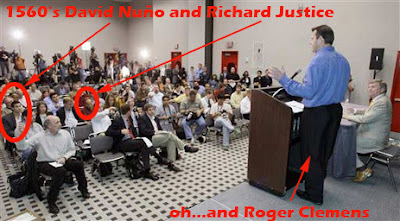 Was 1560 The Game Represented at the Clemens Presser? Sorry, I didn't have time to photoshop deadly lasers shooting out of Clemens eyes straight through Richard Justice's sternum.